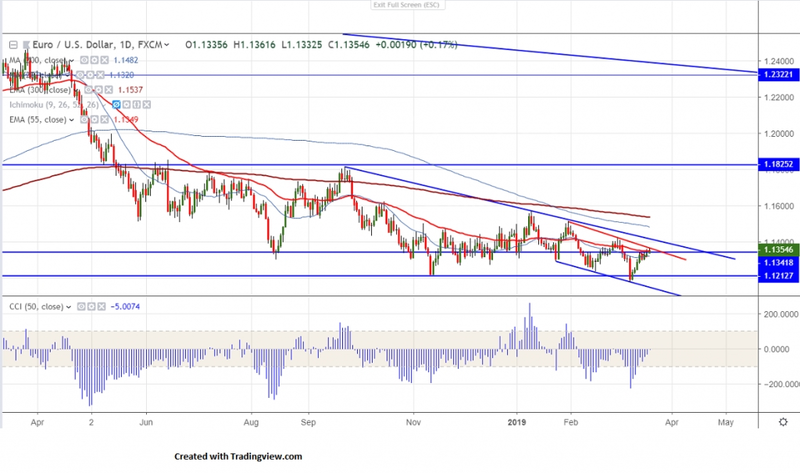 EURUSD continues to trade higher for past 1-week and hits new 2 week high at 1.13616 after declining to 6-month low on Mar 7th 2019. The jump was due to positive Brexit news and broad based US dollar selling.German ZEW economic Sentiment came at -3.6 points compared to forecast of -11.0. It is currently trading around 1.13551. The yield spread between US and German bund has narrowed to 250 basis point from 259 basis point and for 2 year spread hits 11-month low is supporting Euro. With no major economic data today markets eye US Fed monetary policy. It is good to buy on dips around 1.13450 with SL around 1.1300 for the TP of 1.1425/1.1500.